The aim of this study was to further analyse the role of the plantaris tendon by characterising the innervation patterns inside the tendon and in the peritendinous connective tissue between the Achilles and plantaris tendon. 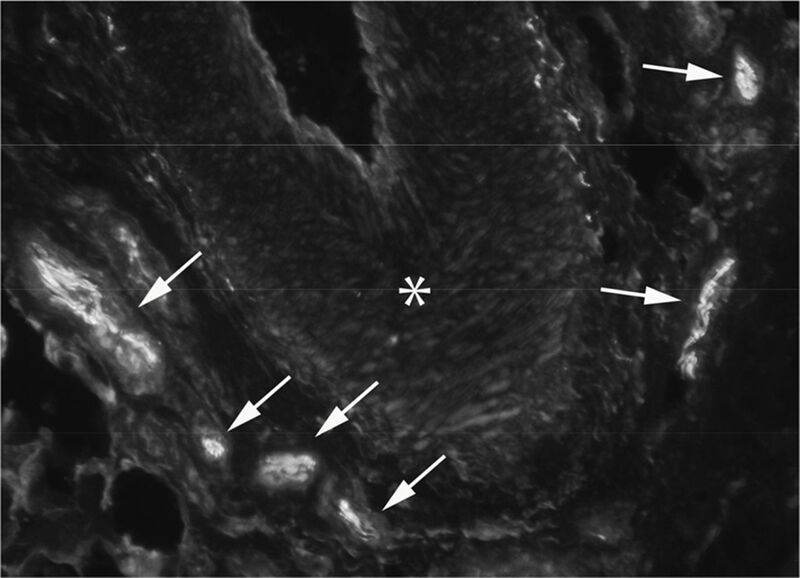 36 plantaris tendons with attached peritendinous connective tissue were then cryosectioned and further processed for immunohistochemistry.6 Antibodies for detecting nerve structures (directed against PGP9.5) were used. Results All 36 samples exhibited PGP9.5 positive areas in the peritendinous loose connective tissue mostly located in close vicinity to blood vessels (Figure1). In 16 out of 36 tendons reactions were also found in the tendon proper mostly located in loose connective tissue spaces. In 4 tendons, reactions were seen in between the collagen fibres, interpreted as possibly being related to sprouting nerve fibres. Discussion Most of the innervation occurred in the peritendinous connective tissue. This indicates the importance of this tissue for pain perception. The observation of nerves in loose connective tissue zones inside the tendon goes hand in hand with studies on healthy Achilles tendons and is thus not necessarily related to tendinosis-like changes.2 Sprouting fibres, features of tendinosis tendons,5 were observed only in a small number of patients. The characterisation of the nerves is currently on-going. These findings indicate that some plantaris tendons themselves show signs of abnormal innervation patterns. The main innervation is however located in the peritendinous connective tissue. This reinforces the importance of this tissue in midportion Achilles tendinopathy. The interaction between the plantaris and Achilles tendon might in turn trigger the pain. The way of interference however has to be analysed in upcoming studies.